In public relations and broadcasting, pros build portfolios of TV coverage for a "sizzle reel" of greatest hits. This week I was pleasantly surprised to learn a longtime acquaintance -- in this case a TV producer and on-air personality who reported on several clients in my P.R. reel -- is an aspiring Olympian building a great reel of life experiences tied to rowing. After bumping into Atlanta broadcaster Conn Jackson at the local premiere for Cirque du Soleil "Kurios" last month, we got to talking about shared interests in the Olympics. The conversation refreshed memories from the time when we each interviewed Olympic swimming champion Dara Torres during her book tour a few years ago. Over the years, my public relations teammates and I also worked with Jackson on TV reports from Philips Arena, Stone Mountain Park, Cirque du Soleil, IAAPA and others as he contributed segments to "Atlanta & Company" through his self-owned business sharing inspiring news. Turns out Jackson is not only an Olympic fan and broadcaster, but also an aspiring Olympian in rowing. 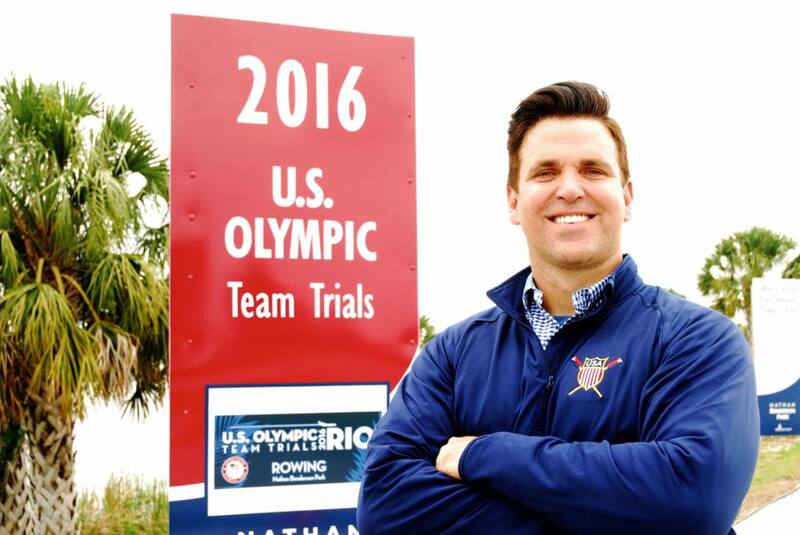 After walking on to the rowing team in college, Jackson eventually competed in the 1996 Olympic trials in an eight-man crew (think "Boys In The Boat" intensity for a berth on Team USA). Unfortunately, Jackson did not make the team for Atlanta's Games. But that was no end to his Olympic aspirations. Inspired by Torres' autobiographical message that "Age Is Just A Number," Jackson again interviewed and even swam with the fortysomething Olympic champion a few years ago (a follow up to that initial interview at which we both were in attendance). This experience and their conversations, Jackson says, gave him the nudge he needed to give Olympic rowing another shot, this time for Rio 2016. Quietly training at the Atlanta Rowing Club, Jackson also logged practice in Virginia and Florida to prepare for the 2016 U.S. Olympic and Paralympic Team Trials hosted by U.S. Rowing. Jackson is in Sarasota now, and tomorrow morning he'll compete in the initial round for single sculls, rowing with and competing against other hopefuls. A field of about 20 rowers will be whittled down to a final group of six, with Team USA's picks for Rio to be determined Saturday. The man to beat may be London Olympian and 2015 U.S. Rowing Team member Ken Jurkowski. On a call from Florida last night, Jackson said he was savoring the experience and reflecting on the journey. He sees part of himself in some of the recent college graduates against which he'll compete. Jackson expressed optimism for the hard work of the next few days, quoting a saying his Grandmother Kennedy often shared. "When you're in the frying pan of life there is only one thing to do: sizzle!" said Jackson.